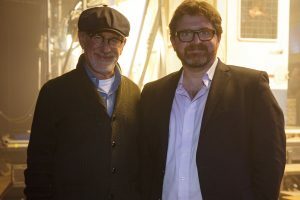 (L-R) Director/producer STEVEN SPIELBERG and screenwriter/author ERNEST CLINE on the set of Warner Bros. Pictures’, Amblin Entertainment’s and Village Roadshow Pictures’ action adventure “READY PLAYER ONE.” ©Warner Bros. Entertainment. CR: Jaap Buitendijk. HOLLYWOOD—Steven Spielberg digs deep into pop culture over the past four decades in his new action adventure “Ready Player One,” somehow managing to sidestep his many contributions in this icon-check visual feast of a film. He says during a press conference promoting the movie, that doing so might appear self-indulgent. “There comes a point when I would have had to just defer to somebody else who liked my movies and not make a movie about my movies,” the acclaimed filmmaker says. The Academy Award winning filmmaker, producer, studio founder and humanitarian is accompanied by several of his “Ready Player One” cast members (Tye Sheridan, Olivia Cooke, Hannah John-Kamen, Lena Waithe, among others) as they talk up the roller-coaster ride of a film based on Ernest Cline’s bestselling book. Set in dystopian 2045, the film centers on a young man named Wade Watts (Sheridan) who only feels alive when he escapes to the Oasis, an immersive virtual reality universe where most of humanity spends its days. In the Oasis, people can go anywhere, do anything and be anyone they want. The fantasy world is the brainchild of an eccentric inventor named James Halliday (Mark Rylance, who previously starred in Spielberg’s fairy tale fantasy “The BFG”), who has passed away and left a sizable fortune behind to the first person who can find three keys. Of course, there are others greedily hoping to win the contest for their own nefarious reasons. When Wade (in his Parzival avatar) successfully completes the first challenge with his friends—called the High Five—they launch into a world of discovery and danger as they attempt to save both Oasis and their real world. Spielberg: Anybody who read the book that was connected at all with the movie industry would have loved to have made this movie. The book had seven movies in it. Maybe 12. It was just a matter of trying to tell the story about this competition, both of these worlds, and to make it a sort of express train racing toward the third act and, at the same time, make it a little bit of a cautionary tale about leaving us the choice of where we want to exist. Do we want to exist in reality or do we exist in an escapist universe? The themes were so profound for me when I read the book. That theme is consistent throughout the whole book. There are so many places we could have taken (the story). Q: The theme of fantasy versus reality is something you are familiar with. Is the process different when you are making something that is escapist or something mirroring something happening that is an historical event? Spielberg: For me, this film was my great escape movie. This was a film for me that fulfilled all of my fantasies of the places I go in my imagination when I get out of town. I got to live this for three years. I got to escape into the imagination of Earnest Cline and Zak Penn (who co-wrote the screenplay). It was amazing. But I came back to earth a couple of times. I made “Bridge of Spies” and “The Post,” while I was making “Ready Player One.” So, I got that whiplash effect of going from social reality to escapist entertainment and I’m feeling it. It’s a great feeling but it also makes my wife and kids kind of crazy because they don’t know who dad’s going to be when he comes home, or which dad they’re going to get. Q: Why did you have so much passion, joy and imagination for this story? A story like this, Ernie (Cline, the author and co-screenwriter) gave us a playground to basically become kids again, and we did. We all became kids again. I was working with young actors in their twenties, if that. That’s where the energy came from. We made the movie on an abstract set. The only way the cast could understand where they were (was) we all had virtual reality oculus goggles. Inside the goggles was a complete (image) of the set you saw in the movie, but when we took the goggles off, it was a big, 4,000-square-foot white, empty space called a “Volume.” But when you put the goggles on it was Aech’s workshop or basement, so the actors had a chance to say, “Okay, if I walk over there, there’s the deejay.” It was really an out-of-body experience to make this movie. It’s very hard to express what that was like. John-Kamen: It was wonderful. We just lived in our own imaginations for five months, where we hadn’t had a chance to do that since we were children. To be able to completely rely on our guts and our interaction with Steven and the other cast, made it so special and different to anything any of us had ever done before. Sheridan: When we got to the live action, everybody was like, “Oh, okay I remember how to do this. This is the real world now.” The hardest part is when you are in an empty space and anything is possible. Q: The songs you use in the film are great. Did you play music on set to get everybody warmed up? Spielberg: We did. I played a lot of the Bee Gees on the bridge. Spielberg: And you can see that walk in “Ready Player One.” It’s in the movie. But a lot of the (ideas for the songs used in the film) came from Zak Penn and Ernie Cline. I have to say that the songs are from their playlist. Penn: We would confer on the phone late at night about which songs off to use. The playlist of songs from his book is absurd and I couldn’t even load it on my phone. But we came up with some good options. Cline: And Ben (Mendelsohn) threw in a couple of choices too, but they were more punk, which I respected. Q: There are so many references to other films in this movie. How did you get the rights? It seems so expensive and so hectic. Spielberg: Kristie Macosko, who along with Don De Line and Dan Farah, produced the movie and Kristie can probably answer that question, because Kristie spent three years with all the Warner Brothers legal people, getting the rights to all—and we couldn’t get all of them, we couldn’t get any “Star Wars” rights. They wouldn’t give up the “Star Wars” rights. Mendelsohn: (who appeared in “Rogue One: A Star Wars Story,” quips) You should have called me on that one, Steve. Q: Tye, what is your personal video game experience? Sheridan: There is a scene in the movie where I play an Atari game and I’d researched the game and watched videos. I’d done as much as I could without actually playing the game. I was like,” I’ve never played an Atari so you guys are going to have to teach me to hold the control. I don’t want to look like I’m holding it the wrong way.” I got lessons from Steven and Zak on that. Q: What game or moment in the film really geeked you out with childhood memories? Sheridan: It was (the appearance of) the Iron Giant (from 1999’s “The Iron Giant”). That was a movie that I played so many time in my childhood. I have a very sentimental connection to that figure. While shooting the movie, we could see our avatars in real time on a 2D screen, and I would look over at my avatar and see Iron Giant’s foot, and I’d think, “That’s Iron Giant’s foot!” That’s so cool. Cooke: I really relished getting to learn the “Saturday Night Fever” dance. I used to go disco-dancing when I was a kid in my hometown. So, Tye and I got really close very quickly with these dance lessons. I don’t know how much of it was digitally enhanced. That probably helped it quite a lot. That was really fun. Sheridan: (quips) All of my dancing is digital. Cooke: That was the highlight of the job for me. Sheridan: Yeah, but three weeks just rehearsing after work or in between (shooting other scenes). Q: Tye, you played John Travolta’s son in a movie, right? Spielberg: I met John in 1976 on the set of “Carrie,” and we’ve been friends since then. I can’t wait for John to see (“Ready Player One”). Q: The younger cast members weren’t alive in the 1980’s. What do you have to say about that decade? Waithe: I was born in 1984, so don’t remember a ton about (that era). But because I grew up in the 90s, I remember a lot of that stuff, the music, like Michael Jackson and Whitney Houston and they really began in the ‘80s, and so it was not hard for me to revisit that. Tye and I watch some ‘80s movies together and just to kind of get in the vibe. The interesting thing about that time was everything was so big and loud and colorful and it was like a prosperous time. That is why I think I was kind of happy that I was born in that decade. That is why it really translates on screen and that there is so much joy, reminding us of a happier time. That is why we are so obsessed with it too. Sheridan: Because the Oasis stands for the great escape. It’s anything you want it to be. Because the ‘80’s were such a vibrant time full of all this crazy hope. I think it makes total sense that there is all this pop culture and ‘80’s references in the movie. Spielberg: It’s hard to find a decade when there wasn’t global and domestic turbulence and seismic change like in the ‘60’s with civil rights and the assassination of Jack and Bobby Kennedy. Spielberg: I got in trouble for doing that. When “E.T.” was re-released, I actually digitized five shots, where “E.T.” went from being a puppet to a digital puppet. I also replaced the guns, when the FBI walks up on the van (and replaced them) with walkie-talkies. So, there is a really bad version of “E.T.,” where I took my cue from “Star Wars,” and all the digital enhancements from “A New Hope” that George (Lucas) put in (when the original “Star Wars” was re-released). I went ahead because the marketing (department) at Universal Studios thought that we needed something to get an audience back to see the movie, so I did a few touch ups in the film. In those days, social media wasn’t as profound as it was today, but was just beginning, and it erupted in a loud, negative way about, “How could you ruin our favorite childhood film?” I had taken the guns away and had put walkie-talkies in their hand among other things. So, I learned a big lesson and that was the last time I ever decided to mess with the past. What is done is done, and I will never go back with another movie I have done and I have control over, to enhance or change it. Q: Could you describe your relationship with nostalgia and how that has changed over the years? Spielberg: I have the most intimate relationship with nostalgia. When I was 11 or 12 years old, I started taking 8mm movies of my family on camping trips to Arizona. When videotape came in, I was using videotape. Then I started taking my 8mm sound movie camera on sets when I was hanging around with (Francis Ford) Coppola, (George) Lucas, (Martin) Scorsese and (Brian) De Palma, and that whole group back in the 70s. I have got something like 60 hours of footage of all of us growing up and making movies together, which someday could be an interesting documentary if I can find the rights to any of these guys. I do all the videos in my life and my family growing up. What we do every single year is, I have a really great editor, Andy, in my office and he cuts together the whole year in the life of my family—all my children and grandchildren—and we have little screenings. It’s called the Annual Family Video. So, I basically live in nostalgia. That might be the main reason why I reacted and responded so positively to Ernie’s book and Zak’s script, because I am kind of living that way most of my life.